At the far end of the room was the wonder of the world: the Peacock Throne. Whether it is one of the seven thrones of the Great Mogul, and was brought from Delhi, I don't know . But it is certainly the most costly ornament that the eye of man can look upon. I inspected it most carefully. It is entirely of silver, a great camp-bed structure, but modeled in lovely designs. It is encrusted from end to end and top to bottom with diamonds. At the back is a star of brilliants that make you blink. 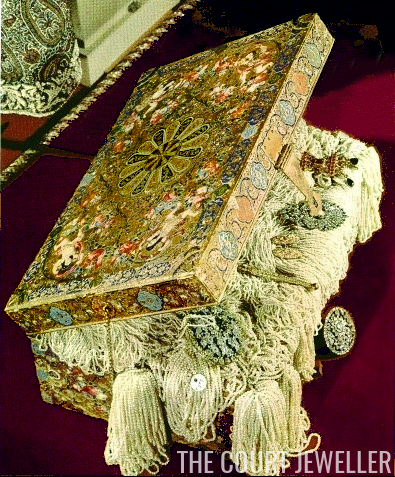 The rug on which the Shah  sits is edged with precious stones, and the pillow on which he reclines is covered with pearls. I could keep on writing about the dazzling beauties of the throne of the King of Kings. But I could never get beyond declaring it to be a superb jewel. Some people have valued it at £5,000,000. Its real value is between £2,000,000 and £3,000,000 . But though the Peacock Throne is the magnum opus of the Persian crown jewels, it by no means extinguishes the magnificence of the other treasures. Who can attempt, however, to recount the number of bejeweled arms, the royal crowns, the flashing aigrettes, the trays piled up with cut and uncut stones, and the bowls filled with pearls that you run through your fingers like a handful of rice? Everyone has heard of the Daria-i-Nur , or Sea of Light, sister diamond to the Koh-i-Nur , or Mountain of Light. Everyone has also heard of the Globe of the World , made by the late Shah, of 75 pounds of pure gold and 51,366 gems -- the sea of emeralds, Persia of turquoises, India of amethysts, Africa of rubies, England and France of diamonds -- and valued at £947,000. 1. 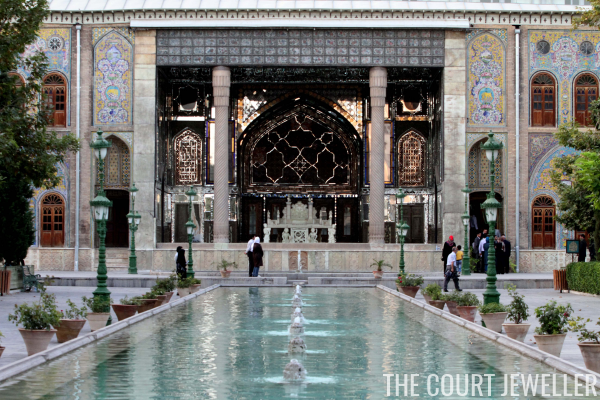 The reporter who wrote the piece was touring the Golestan Palace, the former royal complex in Tehran. The Palace still stands today, and in 2013, it was declared a UNESCO World Heritage Site. 2. It wasn't. The Peacock Throne was made in the 17th century for Shah Jahan, the Mughal emperor who is best known today for commissioning the Taj Mahal. Among the hundreds of gemstones embedded in the throne was the Koh-i-Noor diamond, which today is a part of Britain's crown jewels. In 1739, the throne was stolen by Nader Shah, one of the most powerful emperors in Persian history, during his invasion of Delhi. Although it was captured by the Persians, it isn't the throne that the Iranians call "the Peacock Throne." Shah Jahan's throne was cut into pieces after it was stolen. 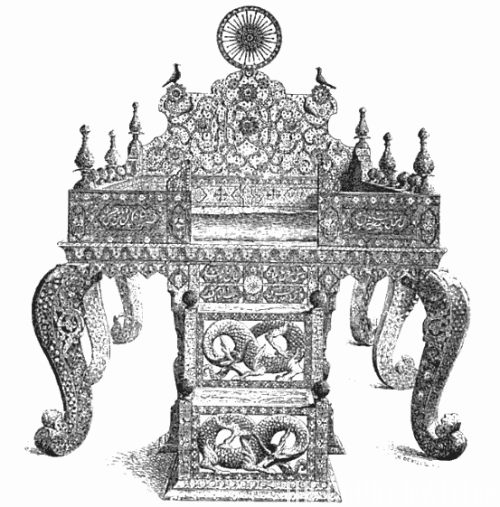 The Iranian Peacock Throne is more correctly called the "Sun Throne." It was commissioned by Fath-Ali Shah Qajar of Persia in the 19th century. For various reasons, the Sun Throne was mistakenly referenced as the Peacock Throne, and the name stuck -- so much so that many refer to the now-defunct Iranian monarchy metonymically as "the Peacock Throne." 3. In 1897, the Qajar dynasty reigned in present-day Iran. The reigning shah was Mozaffar ad-Din Shah Qajar (1853-1907); he had been on the throne for less than a year. Six years later, he was made a knight of the Order of the Garter by King Edward VII. 4. It's tough to translate a monetary value like this into present-day terms, but a commodity worth £5 million in 1897 would be valued at roughly £500 million today. Ditto the more conservative estimate given by the writer: £2-3 million would be something like £200-300 million today. But really -- how do you even begin to value what is essentially a priceless, irreplaceable object? 5. The Daria-i-Noor diamond was probably also a part of the treasure of Shah Jahan, and was possibly one of the gems set in the original Peacock Throne. The diamond is pale pink and weighs approximately 182 carats. The French jeweler Jean-Baptiste Tavernier, who traveled in India in the 17th century, described a pale pink diamond from the throne, calling it the "Great Table Diamond." Many believe that the Daria-i-Noor and the Noor-ol-Ain diamonds, both today owned by Iran, are two portions of that Great Table Diamond. Today, both diamonds are held in the Central Bank of Tehran with the rest of the Iranian crown jewels. 6. 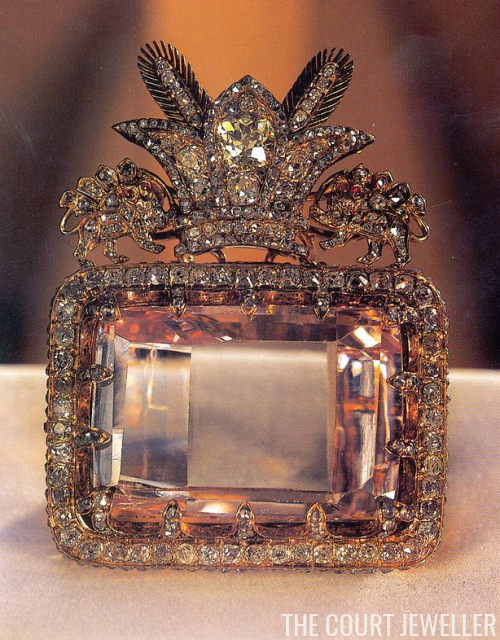 The Koh-i-Noor diamond was also set in Shah Jahan's Peacock Throne and was also looted by Nader Shah of Persia in 1739. After his assassination, the gem fell into the hands of the Ahmad Shah Durrani, one of his generals, who became Emir of Afghanistan. In 1809, Shuja Shah Durrani, then the Afghani emir, pursued a treaty with the United Kingdom, seeking protection from the Russians. He was subsequently overthrown, but he escaped with the Koh-i-Noor to Lahore. As a return for harboring him, Maharajah Ranjit Singh demanded to be given the Koh-i-Noor. After Ranjit Singh's death, the Brits basically took over, and through some controversial maneuvering, the diamond was presented by his son, Duleep Singh, to Queen Victoria. It's been a part of the British crown jewels ever since -- although, as we'll see later today, its place in Britain is constantly under debate. 7. This gem-studded globe is still a part of the Iranian crown jewel collection, and it is housed with the rest of the treasures in the Central Bank in Tehran. The globe was commissioned by Naser al-Din Shah Qajar, who was assassinated in May 1896.